Wedding guests all married? What about doing a count down and presenting the bouquet to the couple married the most years. The garter goes to the couple married the shortest amount of time. While on the topic of bouquets and garters, do you really want stripper music playing during the garter toss? If you don’t be sure to let your DJ or band know ahead of time. They can help you pick a more appropriate song. The friendship bouquet is a unique way to give a special message to all the single ladies at your wedding. 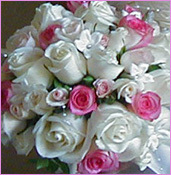 Ask your florish to wrap the “throw away” bouquet flowers in separate bundles and slip your pre-written messages inside. When you throw the bouquet it comes apart with a message inside for each single lady. One of our favorite Bridal Tips is for a couple to consider meeting before the ceremony. We capture the groom’s reaction to seeing his lovely bride and the bride’s special glow. Then we leave the couple alone for a few minutes of prayer or contemplation. This is a perfect time to capture the couple’s excitement by videoing their Romantic Moments as they walk around their wedding venue sharing their excitement of what is to come. Our brides who try this say that it sets the tone for the whole day. They feel more calm and settled by having already spent time with their groom.